Take control of your Treo’s keyboard lights with KB LightsOff! Comfortably use your Treo to read eBooks or watch movies in low light conditions without straining your eyes with bright keyboard lights. 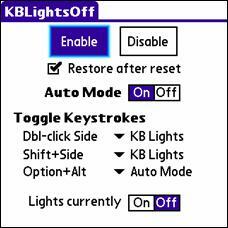 KB LightsOff allows you to turn off the keyboard lights of your Palm OS Treo 650, 680, 700p, or 755p or the Palm Centro when they are not needed, either automatically or manually. In Auto Mode, the keyboard lights will come on whenever you use the keyboard or other keys (configurable), and go off after a configurable period of keyboard inactivity. You can also manually turn the lights on or off with a simple keystroke based on the situation. Specify how long the lights should remain on after your last keystroke. Control what actions will cause the lights to come on automatically, if desired. In addition to keyboard keys, you can choose any combination of the 5-way navigator, application keys, Home and Menu keys and screen taps. Control whether you will hear an audio tone when you switch Auto Mode on or off (volume follows system volume). KB LightsOff is free to try for 30 days. After the trial period, you may purchace a license via PayPal by following the BuyNow link above. Your registration code will be sent to you via email within 24 hours (although typically much sooner). For any questions regarding registration, please send an email to registration@lilapps.com. Please read the file readme.html that is included in the ZIP file for instructions on using KB LightsOff. For a history of changes, see the release notes included in the ZIP file. For other questions, comments or suggestions, please send email to kblights@lilapps.com.